For those of you who read our blog, please if you are in the Los Angeles area after Christmas and before the New Year, stop by to see the annual Viewing Stones Show, presented by the California Aiseki Kai, will take place Dec. 26–30, 2017 in The Huntington’s Brody Botanical Center. A complementary exhibition by the American Viewing Stone Resource Center will be on display during the same dates in the Japanese Garden’s Ikebana House. The Huntington has a nice article on their website about the event: Huntington Article. A number of articles have been written on worked vs. unworked stones. If you haven’t read Wil’s article, you can find it on the Aiseki Kai web site, as it is one of the most important historical articles on the subject that I have read. In addition, Tom Elias and Hiromi Nakaoji wrote two articles for BCI that received worldwide coverage for the exposé they wrote on worked stones in Japan. Do we need another article? Perhaps not, but I hope you will take the time to read another viewpoint from a collector of stones. As a photographer, I think there is value in observing similarities from other art forms when faced with difficult topics. Herein lies my attempt to do so. This is an except from a book I’m working on entitled In Search of a Stone. Let’s use the above stone as an example for our discussion. This stone is currently available at the S-Cube shop. It is priced at ¥180,000 or roughly $1,600 USD. A beautiful shape, nice patina and lovely daiza. This is a completely worked stone, manufactured by an incredible stone worker. Is it suiseki or not? We look forward to hearing your views on the subject. We had admired this stone for quite a while it being on Matsuura Arishige’s personal website; he was the past chairman of the Nippon Suiseki Association. An opportunity arose last December and we elected to add it to our collection of small stones. The box was inscribed by Tanimoto Hyakusui a Furuya specialist from Wakayama. The stone has a deep patina giving it that feeling of a very, very old stone. It is strikingly nice being only 9cm in length. The daiza is unsigned therefore the maker is unknown. On the right side of its box it reads “Kamuikotan ishi”, and the name is “Shoshuhei”, the three characters of which literally mean, “Small superlative flat”. “Shuhei” is a name that has been given to other danseki, and even doha, and if you put it into more natural English it would be something like “Great Plane” or “Outstanding Plane”. The prefix “sho”, meaning small, has been added here, because the stone is small! The box is then signed on the left side, “Sekiyusai”, which was one of Tanimoto’s artistic names later in his career, and the seal reads “Hyakusui”, which was his given name. The provenance is well documented as the stone was from Tanimoto and was sold to Sugii Chugi a prolific collector from Kyoto, and then passed on to Matsuura, who signed the inside of the box lid to document his ownership and then the stone was passed on to us. We are grateful and privileged to have ownership of this stone for a while. The last two stones we have posted we hope to bequeath to a museum, or give them to a collection in the future that can be seen by others. Stones of this quality should be seen and enjoyed by many. We hope it is cooler where you are as it is 95F or 35C here today! As collectors of stones from numerous countries and followers of the antiquity market, we often review serious auctions of fine viewing stones. Today’s post covers auctions that were held in Hong Kong, London and New York some time back. We hope that it encourages us to document our stones as we spoke of in one of our more recent blog posts. As with any art market, there is a tremendous latitude in pricing. If you follow the Early American furniture market, you can be surprised, if not shocked, at the variability in prices for furniture. In October, 2007, at a piecrust-top mahogany tea table, circa 1760, attributed to the “Garvan” carver of Philadelphia, sold for $6.76 million at Christie’s Oct. 3 sale and this doesn’t include the buyer’s premium. We know what you are thinking, we’ve seen similar tea-tables with a single comma in their price. Why is this one so expensive? The craftsman credited with the design of the table is considered the most accomplished carver working in Philadelphia in the 1750s and early 1760s and is known for a boldness and vigor in his carving. He is known solely by the body of surviving furniture bearing his distinctive hand. A tea table attributed to the Garvan carver is in the collection of the Metropolitan Museum of Art. So craftsmanship, beauty and provenance sent this piece with an original estimate of $2-3 million to nearly $7 million. A bit too lofty for most of us I’m afraid. So back to stones, as many of us have collected stones, or purchased them, what long-term aspirations do we have for them. We personally have 3 stones collected by Mas Nakajima, a highly influential suiseki collector from the West Coast, and for us personally this added great value to these stones. Not just because they were beautiful, but also because Mas found great value in them and most importantly because he personally collected them. A beautiful Black Butte stone collected by Mas Nakajima and gifted to us. We subsequently hired Jerry Braswell to craft a rosewood daiza for it and we believe he did an excellent job. It was accepted and shown in the 4th Japan Suiseki Exhibition held February 10-13, 2017 at the Tokyo Metropolitan Art Museum. I hope you see where we are going with this lengthy description. From Mas’ wonderfully talented eye in collecting the stone, to a well matched rosewood daiza to accompany it, to being selected for display at one of the world’s most prestigious stone shows. Keeping this documented for its future owners we believe adds value to the stone as well as making it even more collectible as an art object. We hope you don’t take these past few paragraphs as some way of saying look at our collection, we simply don’t mean nor intend for it to be that. We are just passionate that we as collectors document objects in our collections for future generations. Recently, we were fortunate to collect two well documented stones from Japan. These will be the topic of a future post; however, for today we would like to share with you some stones sold in a Sotheby’s. So lets’ take a few moments to share with you a number of works of art that sold during this auction. This nationalistically molded porcelain scholar’s rock molded in the form of a craggy rock of irregular outline and deep undulating fissures, the porcelain a dark color with a fitted wood stand. The estimate was $800-1,200 USD and it sold for $12,500 USD. When first observing this object, we remarked that it had a beautiful patina for a stone. Only until we read the caption did we discover this is in reality a porcelain representation as a stone. Very well done wouldn’t you say. In the shape of a mountain peak, of a silky smooth surface and pewter gray in color, with holes penetrating the crags, inscription carved onto small areas of the rock: Li da zhen wan (the favorable precious gift) and Shi Hanzi kuiwei nian, Sanlink zhi shi (the stone replaced at Sanlin, the guiwei year of Shi Hanzi) with wooden stand. Estimate $8,000 – 12,000 USD. 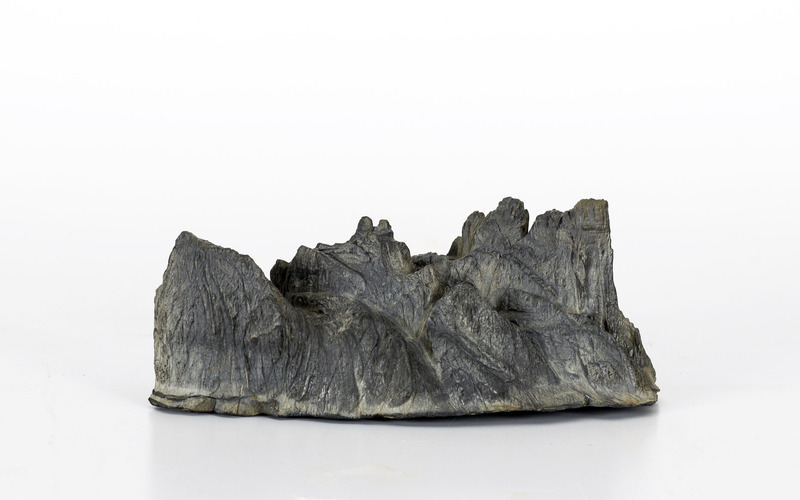 Naturalistically modeled in the form of a mountain with steep crests, small pits and crevasses, inscribed to the base with four characters reading Xinghua shanguan, the wood of a rich dark chocolate-brown tone with a matt finish. Estimate 3,000-5,000 GBP and sold at 5,250 GBP. A yellow wax stone in horizontal orientation, naturalistically modeled with pits, deep crevasses and perforations, the textured stone of an orange-yellow tone with a matte finish, wood stand. Sold for 3,750 GBP. 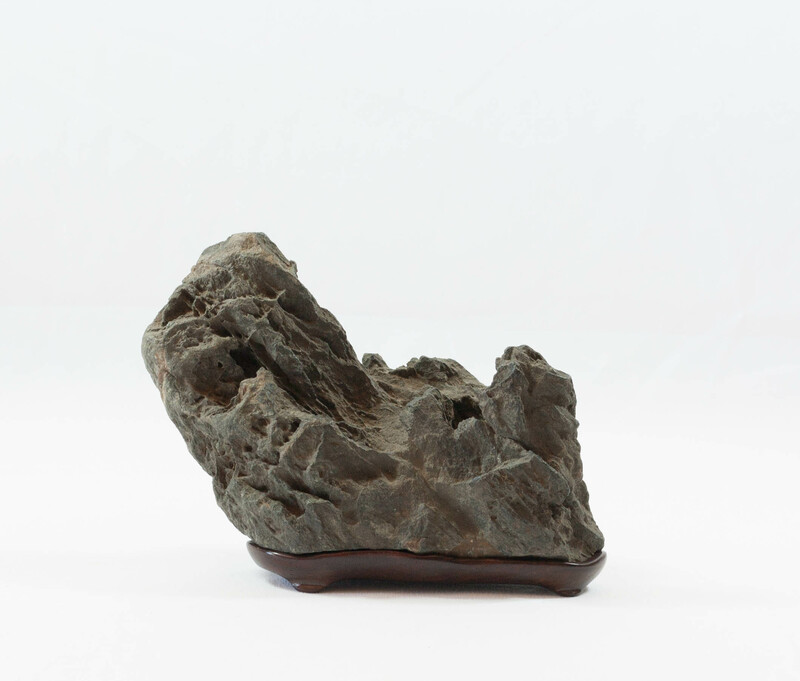 A Huanglashi Scholars’ rock with a narrow foot rising to a cloud-like plume, filled with perforations of various sizes, the stone of ivory color with caramel and crystalline inclusions, with a wood stand. Estimate $6,000-8,000 USD and sold for $6,250 USD. 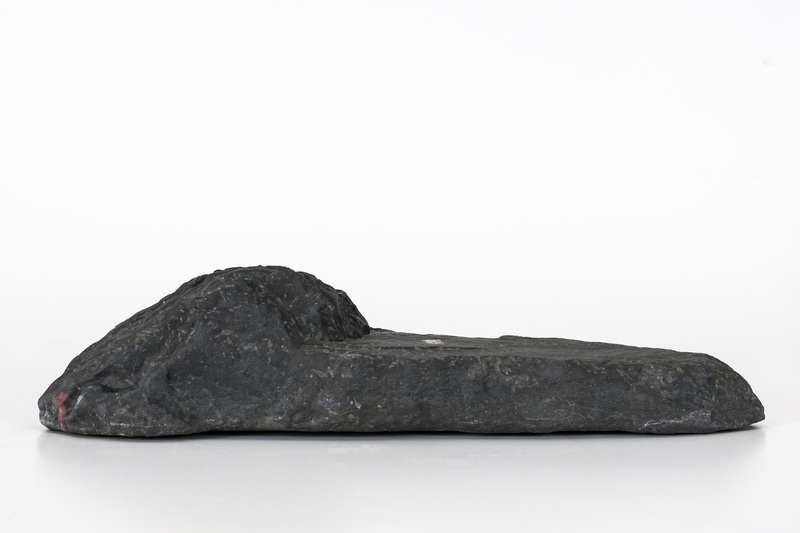 A Qilian Scholars’ rock of flattened form, the outline resembling two peaks with an overhang, the ‘eyes’ imparting a sense of lightness to the furrowed undulating surfaces, northern style wood stand. Estimate $6,000-8,000 and sold for $6,250. A Yellow Wax Scholars Rock with a weathered surface enlivened with rhythmically spaced hollows imparting a feeling of lightness, the profile resembling a swooping eagle, the mustard-yellow rock with some orange inclusions and waxy appearance. Provenance: Ian and Susan Wilson, San Francisco, CA, USA. Literature: Nicholas Grindley The Ian and Susan Wilson Collection of Chinese Scholars Rocks, London, 2009, no 61. Estimate $10,000-12,000 and sold for $18,750 USD. An exquisite stone by very well known collectors. The texture, patina and stand are all superb. To all of you that expressed how much you enjoyed our catalog – thanks! To those that purchased pots, a special thank you for your order and we hope you enjoy them for years to come. We have marked the pots which have been sold. Just click the above link for the updated catalog. Many of us met on Facebook and once it was a terrific place to meet and catch up with people as well as meet new friends who share similar interests. However, over the last 6 months it seems Facebook has become more about political views and ads than anything else. After reviewing my feed for more than two weeks I noticed that the majority of posts where about political positions both left and right and an unbelievable number of sponsored ads for everything imaginable. For this reason, I decided to deactivate my account. Perhaps I will return at some point if the site returns to its original roots of keeping people connected. But for now, it just seems best to walk away from it. Having done so, it has been eye-opening at the number of friends that have done exactly the same thing over the last few months. Perhaps this doesn’t bode well for Facebook and I do wonder if investors are starting to pay attention. Regardless, we hope you stay in touch through our blog, email and phone. Years ago, we had the opportunity to work on a project to build a software museum collection project entitled EmbARK and interestingly enough that software is still in use today some 25 years later. This software was created to catalog the New York Museum of Modern Art and the San Francisco Museum of Modern Art’s fine art collections. This project was quite interesting in that it provided us insight into the need to catalog art, its history and its provenance. So it was eye opening to us when we began to collect stones in the US that very little was done to preserve the history, or provenance, of the stones we were collecting and/or buying. There were however a few exceptions and this was primarily stones we purchased from Japan. In Japan it is very common to record the history of a stone on the kiri-bako that is used to store the stone. Often recorded on the box is the name of the stone, the river it was collected from, the period in which it was collected as well as a current or prior ownership history. We have always placed a high value on collecting stones of this type as it more closely fits our acquisition model of paintings and artwork that we collect. We believe having the story of the stone adds significant interest and value. 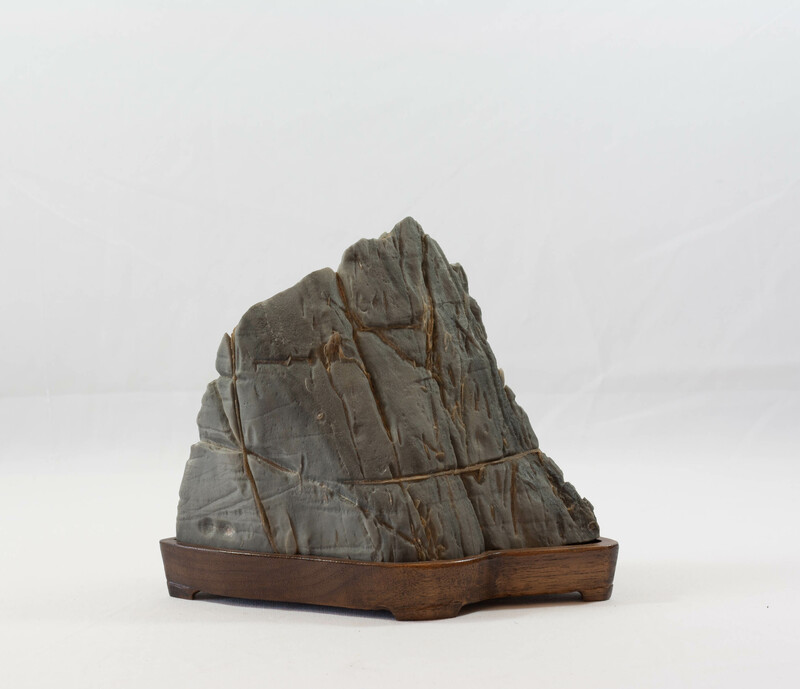 This small Furuya-ishi stone was auctioned at Christie’s in December, 2015, at the Beyond White Clouds – Chinese Scholar’s Rocks from a Private Collection. Yes, we find it interesting as well that a Japanese Furuya-ishi was sold in a Chinese Scholar’s Rock auction, but there you are. This 14.5cm stone sold for 300,000 HKD or at the time $38,891 US. You, like us, might be taken back by the price of this rather small stone – 5 3/4-inches. However, as we continue to look at the history of this stone we begin to understand why it was able to bring that price at the auction. This stone was from the late Edo period in Japan; 1603-1868. Here is the lead-in on the auction page. So we see that the stone’s provenance reaches back to at least 1852 with a signature on the box dated 1875. So the stone’s history is at least 165 years. Let’s continue to review what also came with this historical stone: A mounted album of commentaries by various connoisseurs. What follows is the rest of the auction catalog description of the stone, box and album. 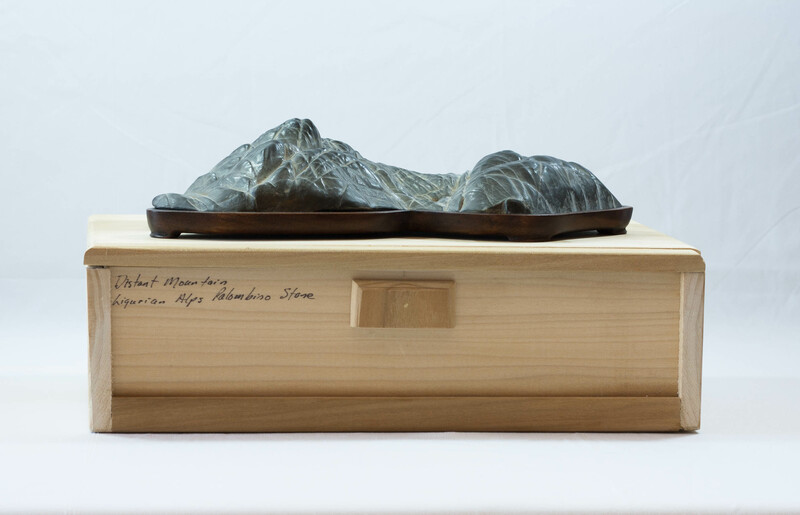 “The current rock mountain is fitted within two Japanese wood boxes. The cover of the smaller wood box is inscribed on one side with the characters long men (dragon gate), signed Gyokuzen; the other side with an inscription by Gyokuzen with a cyclical renzi date corresponding to 1852, explaining that he has renamed the rock ‘Mount Horai (Penglai)’, an immortal dwelling supported on a turtle’s back in Chinese mythology, due to its resemblance of the underside that is similar to the texture of a turtle shell. Gyokuzen is the studio name of the renowned literati painter Yamamoto Baiitsu (1783-1856), who was active during the late Edo period. The other larger wood box is inscribed on one side of the cover with the characters reading Mount Horai, signed Nyoiou with a cyclical yihai date corresponding to 1875, and a seal reading Taiko; the other side with a seal Chisendou. Nyoiou and Taiko are both studio names of the Meiji-period poet Tani Tetsuomi (1822-1905) active in the Omi area, while Chisendou is the studio name of the seal carver Okumura Chikutei (1873-1927). The rock is also accompanied by a mounted album with commentaries by 15 literati active in the Omi and Kyoto areas during the late 19th to early 20th century. In this album, the painter Murata Koukoku (1831-1912) portrayed the present rock mountain in two illustrations, and in a commentary dated to 1873 noted that the rock was originally possessed by Kosugi, and later came into the collection of Yamamoto Baiitsu, whom first named the rock ‘Dragon Gate’ and then ‘Mount Horai’. Its ownership had thence been transferred to Ichida. It is likely that Kosugi refers to Kosugi Goroemon (1785-1854), a Japanese entrepreneur active in Omi area during the late Edo period, while Ichida refers to Ichida Yaichirou (1843-1906), a Japanese entrepreneur active in Omi area during the Meiji period. Since the larger wood box bears the signature of Tani Tetsuomi dated to 1875 on one side and the seal of Okumura Chikutei on the other, it is possible that the rock mountain was later passed on to Okumura Chikutei and then to Okumura Chikutei. This is an amazing set of documentation for the provenance of this stone. I think most would be proud if this were a part of their personal collection and from our perspective this stone and album is certainly museum worthy. So you might be asking at this point – what’s the point, none of us, or very few, are going to spend $38,000 for a stone and book – we agree, and of course, this is not our point. Now, we ask you would this stone be worth $38,000 to anyone without the recorded provenance of this stone? This points to the object of this discussion: we would like to emphasize the need for us to better document our suiseki, scholar stones and/or viewing stones. Perhaps we might ask ourselves who cares about the stones we collect? We should! How often have you purchased a stone that has clearly gone through numerous hands to hear when you ask about the history of the stone at best the only thing that can be said is maybe, and I repeat maybe, what river it was collected from some time ago, and even this is often a guess. Typically we have no idea who collected it, who made the stand upon which it sits or any other valuable information that would be helpful for us or for generations to come. Not everyone will build, or buy, a box to store their stones. We understand that, neither will we; however, let’s begin to think about at least creating something in writing that we can pass along with the stone in the future. Janet Roth is perhaps one of the greatest examples as I can give her credit for her fastidious documentation of her bonsai collection. She keeps very good notes not only on the acquisition, but also the progress and work she performs on her trees. Might I suggest we begin to do the same level of documenation for our stones. Here is just a few suggestions on what to write down. Characteristics of the stone: color, texture, shape, size, etc. I’m sure there are other things you might want to write down, such as where you were when you purchased it, the memories of that trip, etc. Whatever is relevant to you at the time as this will all become a part of the personal history of the stone. I know if we were to purchase a stone like this, having its history would be very meaningful. In addition, we want to do this so that our stones and stories will exist long after we depart this earth! We often receive inquiries in regards to selling stones, pots and the like. We are more collectors of stones than sellers and we understand how frustrating it can be to find high quality stones. Our friend David has finally launched a web site David’s Case to help you find that perfect stone. We have purchased many stones from David and are always amazed that he finds some of the best small stones from both American and Japan. He is good in his communication, fair in his prices and ships extremely quickly and safely. We hope you visit his new site and congratulate him by purchasing one of his fine stones. One of the first things we noticed when obtaining an older, high-quality pot or stone is that it often comes stored in a wooden box. Known as a kiri-bako, these lightweight but very strong boxes keep things safe and allow for your collection to be stacked when storing them away. There are several people in the US that makes these boxes and the wood can be purchased in the US to make your own. Often when acquiring a pot or stand in Japan, we have kiri-bako made so that the shipment has a better chance of arriving intact. After shipping several stands to see them broken or destroyed the investment in the kiri-bako became more of a necessity than a luxury. In our search, we discovered a kiri-bako maker in Osaka, Japan. Soichiro Kobayashi is a third-generation maker of kiri-bako. On his web site he refers to them as Paulownia wooden boxes. Paulownia wood can be obtained from China at very reasonable prices; however, Sochiro explained to me that he purchases his Paulownia from North American because the grain is so much straighter. Communication with Soichiro was excellent and he was very careful to understand our requirements. The order was for 11 boxes; ours and our friend Paul’s. We provided exact measurements of each object; pot, stone and stand. Next we decided which style of box would be best. There are numerous designs available based on the size of the object, how you wish to access it and how large it is. The company is small but they have a significant output of high quality boxes. From the photo you can see lots of wood working equipment and Paulownia everywhere! Katsumi Saito has been making Paulownia boxes since he was 12 years old. He is a very skilled craftsman and with his years of experience you can be assured your box will be of the highest quality. Tetsuko checking the fit of the top of a beautiful Paulownia box. Tetsuko, Soichiro’s wife, also works on the production team. Note from her picture that these boxes can be made in all sizes including quite large. An example of kiri-bakos made for us. The first thing we noticed is the quality of the Paulownia. The grain is very straight and the finish is superb. The framing used on the lids was an extra touch that we did not expect. It is this attention to detail, in our opinion, that separates their work from those making boxes in the U.S.
One of the stands we purchased from Japan and shipped to the US arrived damaged. Fortunately, our friend Jeff knew an antique restorer in San Francisco and we were able to have it repaired. It was nearly impossible to tell that it has been damaged as their work was superb. To avoid this from occurring again, we decided to have a box made for it; see photo above. This type of box has two parts – top lid and container underneath. Notice the detail in the lid with the cut-outs to allow for easy lifting of the lid from the bottom container. We really appreciated this design for its simplicity and protection. The box was also fitted with material so that the box could be tied. This provides a way to carry the box. Overtime this wax begins to turn a beautiful shade of amber that gives it that aged patina that we so much appreciate. Another service Sochiro provides is written documentation on the outside or inside of the box. Note, that this can add considerable costs to the box. We had 11 boxes made at the cost of ~$650. The addition of writing on the box added another ~$300 in charges. You will have to decide if the additional cost is worth it. Our writing fees we higher due to the amount of Kanji characters used in the description. Since some of our most valuable pots, stands and stones were going to be housed in the kiri-bako we thought the additional cost for having them documented was worth it. Please let Sochiro know that you found him from our blog. He was kind enough to answer our questions and send us photos so we would like for him to know his time was well spent. We have no business arrangement with him therefore there is no monetary relationship. Our only hope is to provide you with an excellent source to have kiri-bakos made to house and protect your collection. Shipping cost were reasonable as the boxes are lightweight and can be stored inside each other (depending upon sizes of course) to reduce the overall package size. Communication with Sochiro was excellent with an acute attention to detail. Share with us what you have made by his company. If you have other questions, please feel free to contact us. Izutsu, Toshihiko and Toyo, 1981, The Theory of Beauty in the Classical Aesthetics of Japan, The Hague, Boston, London: Nijhoff. Tanizaki, Jun’ichirō, 1977, In Praise of Shadows, trans. Thomas J. Harper and Edward G. Seidensticker, New Haven: Leete’s Island Books. In our own stone collecting, purchased or personally collected from a stream or river, we tend to be drawn to stones that attract our heart and eye. There are just certain shapes and colors that draw us in. In continuing to research these various aesthetics, we came across the stone and bronze sculptor Kan Yasuda from Japan. We were drawn to his work as it reminds us of many viewing stones we have seen. We were immediately drawn to the form and color of his works. Christie’s in New York is holding an exhibition of his work entitled Touching Time being held from February 24 through March 26, 2016. This sculpture is reminiscent of some of the finest suiseki we have seen from Japan both beautiful form and color. We view this and instinctively sense tranquility and quietness; attributes we love to have in stones in our personal collection. A lovely setting in a park with a white marble sculpture that reminds us of so many river stones that we have seen in various other colors. A similar shaped stone sculpture in a darker color The form is very pleasing and reminds me of a suiseki stone in the book Suiseki. An Art Created by Nature. The Nyogakuan Collection of Japanese Viewing Stones. 2005. Kan working in his study and his art being displayed with children playing on and around it. That his sculptures can be touched rather than just seen is quite appealing. This sculpture was accomplished in bronze. A pleasing form in both smooth and rough textures. It reminds us of a stone that might be seen in a suiban display. It is difficult to comprehend the complexity in creating these sculptural forms. Kan states that he creates with the intent of these lasting for 500 to 1,000 years. Perhaps this also gives us insight into the complexity of his mind that can devise such a pleasingly simple visual design in such scale. To see more of his works, please visit his website.